Poncha Springs may not be well known as a city in Colorado, but they are making up for it in the brewing of fine craft beers. Elevation Beer Company has only been open for business for less than a year, but their beers have garnered a lot of attention so far. 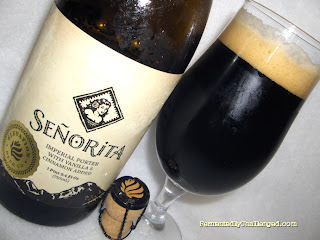 This beer review covers one of their Black Diamond Series beers called Elevation Señorita Imperial Porter. This beer was brewed to resemble Horchata - a classic Spanish / Mexican style drink. In addition, the beer is meant to be an Imperial Vanilla Porter with a slightly sweeter taste. Elevation lists these as their ingredients - Hops: Northern Brewer (wild American tones), & Chinook (bittering hop). Malts: Two-Row, Crystal, Aromatic Chocolate, Roasted Barley, and Flaked Barley. Extras: Milk Sugar, Cinnamon, Madagascar Vanilla Beans. Señorita comes in a cork and wire cage 750ml bottle. It weighs in at 8.4% ABV and 35 IBUs. They even number each bottle. This one was Bottle number #01023 and was packaged in the Winter of 2012 according to its label. The label also lists a complete description of what you should discover with this beer, but if you're like me, I'd rather find out for myself and see what I actually find. Appearance: Elevation's Señorita popped the cork with a very low pop, almost as if there wasn't much carbonation in the bottle. 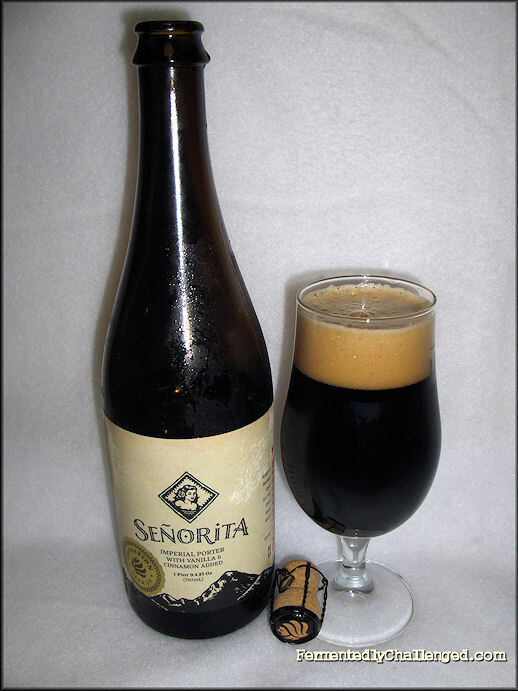 Señorita poured a very dark brown with a modest 1-2 finger tall head. When held up to the light, I could make out some lighter reddish brown tones along the side of the glass, but the beer itself was dark enough that I could not see through it. There was a light lacing that clung to the glass after the foam settled. I couldn't tell whether there was any sediment in the glass or not. Aroma: Seeing how this beer was a cinnamon vanilla porter, I expected to get hit up front by that aroma. Instead, the vanilla and cinnamon seemed to be hiding behind the sweet malts and earthy spice hops. I could pick out a hint of roast in the air, but I really had a hard time finding much vanilla or cinnamon in the nose at all. The last vanilla porter I recently had was quite the opposite where the vanilla was very strong. Not here however. Perhaps it would show itself later. Otherwise, the overall aroma was of a sweet porter. Taste: Ah OK, here is the vanilla and cinnamon. It took a combination of taking a deep whiff and sipping this beer for the vanilla and cinnamon to come out of hiding. The malt base was sweet from the milk sugar and the spices came through on the tongue. The combination of taste and smell works best together. You won't get it all just by smelling it. The cinnamon was distinguishable, yet was not dominating. The vanilla poked out a bit more. The mild roast combined with the sweet malts was solid from start to finish. It was a wonderful tasting porter that didn't dry out the mouth, but rather left it watering. This was a medium bodied brew, that seemed to balance the sweet with just enough bitterness. I detected a hint of pepper on the tongue, but must be coming from the hops perhaps. Overall: If I had to judge this beer based upon the aroma alone, then it needed to beef up the vanilla and cinnamon a bit. However, when tasted the ingredients suddenly come out and make this porter what it should be - a rich flavorful porter that's not too sweet, just enough spice to add uniqueness, scaled back on the roast just enough and leaving you wanting to take another sip. This beer won't dry you out either. I like that in a dark beer. While I enjoyed this beer thoroughly, I wouldn't put it up there with the best vanilla porters however, as I expect to get a big nose full of vanilla up front. Still, worth your time to seek out and try if but only once. - Elevation announces Spring 2013 beer releases. - Elevation Prostator Smoked Doppelbock review.